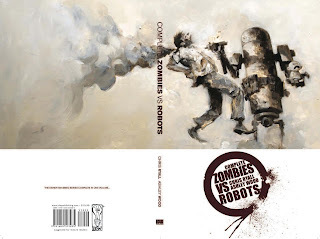 The COMPLETE ZOMBIES VS ROBOTS trade paperback, featuring the stories Ash Wood and I did in the first two miniseries and in the short-lived D'AIRAIN AVENTURE series has been sold out and out of print for a while now. But that's going to change shortly--we're going back to press on it, with the above cover (not to be confused with the original oversize hardcover edition, which also had this same cover, but which was oversize and is also out of print, and only contained the first miniseries). OOOOOOOO!!!! In this blog, is "Ash Wood" the Ashley Wood who did the covers for the reprints of Generations??? If so, I loved those covers- they were fantastic! I was wondering what happened to the artist, glad he's still alive and working! what can i say about chris ryall's story telling ....I KICKS A@@!!! zvr is one of my all time fav's i just hope and pray that hollywood stops that remake train and makes ZVR!